I’ve been hearing for the last week or two about “Which #1 will go down this week?” Do you really hear that in any other sport? Sure, you may in college basketball, but you don’t in the NFL, MLB, or even golf. The reason why is simple, college football is a playoff every week. If we go to an actually off-season playoff, this will go away. Now, the people who are pushing for a playoff system say that it won’t affect things at all. They say that the number one slot will be just as important because of the playoff seatings. That may be true, but the weight of number one will go way down. It will almost be like that of college basketball. Number one will be the star and get all the attention, but the attention won’t be near as close in the off-season. That means you won’t get questions like “Which #1 will go down this week?” What you will hear is “#1 is down but they still have a shot in the playoffs.” We already have that with the NFL. The uniqueness of college football also brings the highest drama. Now I don’t like drama in my personal life, but drama and intrigue are what make great sports even better. So for those who love the playoffs who think it won’t affect that, you are wrong. Yes, it all comes down to money. The BCS will change when they can figure to make more money than they do now. In fact, that’s why they added a national championship game. It was an extra big time game added to the 4 bowls that had the big games. The BCS will change to a playoff when they can figure how to keep they big money they get flowing during the season. Right now, that is not going to happen. 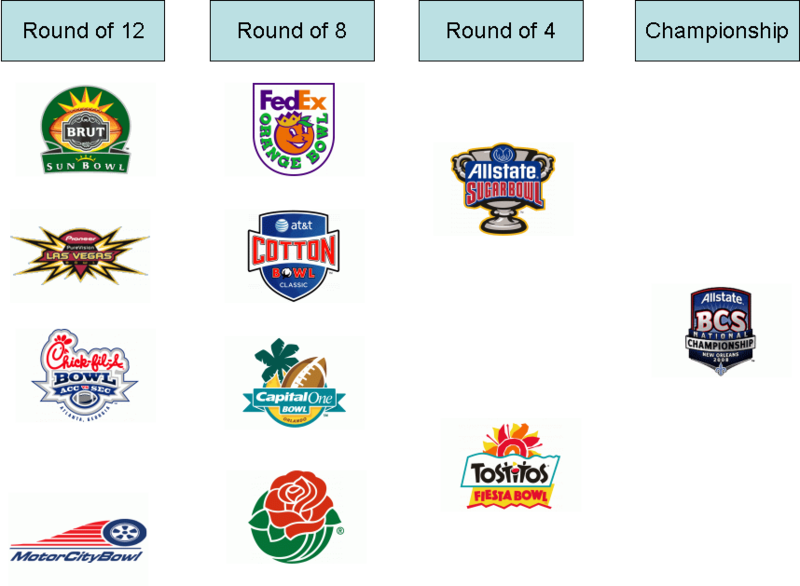 I welcome the people who want a college football playoff to come up with a plan that makes the same amount of money or more for college football during the season as well as in the BCS bowls. No, I’m not going to go into how a playoff will kill the lesser bowls. That will be an argument for another week. I will say that it is almost impossible to keep the drama, the intrigue, and the cash flow that you get with the current system today.